STORServer seamlessly facilitates customer’s migration to the IBM Cloud for every type of data storage need. The integration of the cloud with our award-winning data backup appliances simplifies this transition and brings the IBM Cloud’s secure and reliable technology, ease of use and flexible infrastructure to a broad range of customer environments. By making the IBM Cloud part of an enterprise data backup and disaster recovery environment, our customers save valuable time, reduce costs and experience greater flexibility. They also experience the numerous technological advantages inherent to the cloud. Integrating the IBM Cloud with a STORServer appliance simplifies data storage and management. Our solution minimizes administration time by automating daily tasks associated with data protection and advanced customizable reporting. This allows employees to reallocate their most valuable resource, time, to other areas of the data center. When working with the data protection experts at STORServer, an IBM Cloud implementation and migration will be completed on time and on budget. Customers receive a complete suite of time-saving benefits including installation, integration, service and support. With reliable end-to-end data protection STORServer acts as a company’s single point of contact for data protection with both the IBM Cloud and an on-premise appliance. Instead of making a significant upfront investment in storage hardware requiring constant monitoring, maintenance and the must be replaced in three to five years; cloud backup is infinitely scalable on demand to meet ever-changing data growth and storage needs. By moving backup data to a cloud environment, businesses replace a traditional lump sum capital expense with a more budget friendly operating expense. This is in addition to the cost savings associated with employees’ time outlined above. 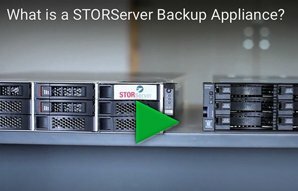 With a virtual appliance from STORServer, restores can be performed in the cloud, reducing the potential downtime of critical systems from hours to minutes. Switching to the cloud provides companies with greater flexibility to adjust storage capacity and other data protection resources on the fly e.g. bandwidth, compute power and even disk speeds. A paid subscription plan offers both scalability without a large capital expense and a more predictable budgeting process. STORServer’s turnkey cloud solution fits with a company’s existing environment including software implementations, available bandwidth (WAN), recovery point objects (RPO) and recovery time objectives (RTO). This secure and customized approach allows for businesses to trim expenses, save time and enjoy greater flexibility while meeting their data backup needs. Browse our data protection solutions and contact us to learn more!